Fifty-five years ago this month Joe Louis and Billy Conn fought in one of the most memorable heavyweight boxing matches ever contested. Billy was the light-heavyweight champion moving up to try to win the biggest crown in sports. 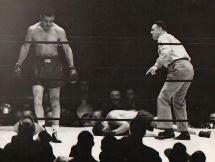 Joe Louis was the dominant heavyweight champion with seemingly no worlds left to conquer. They fought on June 18, 1941 at the Polo Grounds in New York. This match was high drama featuring the classic boxer puncher against the clever master boxer. Billy Conn, the challenger, was a great fighter with a very good record although he suffered a number of defeats early in his career. Most of Billy’s early losses can be attributed to the fact that he started fighting professionally when he was very young, turning pro at the tender age of 16 in 1934. He lost 7 of his first 15 fights before the age of 18 against older, physically stronger opponents. Billy would lose only 3 more times over the next 6 years – all to world champions and all by decision- until facing Joe Louis for the heavyweight title. By the age of 20 Billy had defeated 5 world champions. Those champions were, Vince Dundee, Young Corbett III, Teddy Yarosz, and Babe Risko as well as future champion Fritzie Zivic. All in all Conn defeated 10 world champions including Solly Kreiger, Fred Apostoli, Melio Bettina, Tony Zale and Gus Lesnevich. Conn was a great boxer with fast hands who could box inside and outside, he moved well and slipped and blocked punches beautifully. He boxed with his chin down and his hands up using movement and a quick sharp jab to control his opponents. He threw lightning like combinations and worked them up and down with precision and accuracy. As a pure boxer few in history were better. Billy won the light-heavyweight title with a clear unanimous decision over Melio Bettina and made three successful defenses before campaigning against heavyweights. As a light-heavyweight he is one of only six 175-pound champions who defended their title to never lose a title fight in that weight class. Conn proved that he could be successful against the big men when he won seven fights against heavyweights before challenging for the heavyweight title including victories over contenders Gus Dorazio, Al McCoy, and Bob Pastor. The most impressive of these was his 13th round knockout of Pastor. Pastor had a proven record defeating many of the uncrowned black heavyweights of the late 30’s and was a difficult opponent to beat. Faced with a clever boxer like himself Conn demonstrated in this fight that he could adapt and change his style to suit his opponent. Conn stunned Pastor with an aggressive body attack that wore him down. The New York Herald Tribune reported “The boys had come to see a fencing match. They saw a slugging affair, with…Conn crushing (Pastor) who didn’t believe that Billy had anything except a left jab.” Conn pounded Pastor unceasingly with left hooks to the body and floored him with a right cross to the chin. The knockout in the 13th included practically every punch in the textbook. For Joe Louis it was his 18th title defense in just under 4 years. It was in fact his 6th title defense in 1941 and it was only June, meaning that Louis was fighting once a month for the year. There was much talk that Louis was suffering from burnout with the hunger and desire already gone. Fighting that often against all comers had to be taking its toll was the general consensus. This was reflected in the odds which had Louis at 3-1 over Conn, the closest of any opponent since his rematch against Max Schmeling in 1938. There can be little doubt that Joe Louis took Billy Conn lightly. He had defeated all opposition, usually in impressive fashion up to this point. Louis main concern was that he would be criticized for picking on someone who was considered “too small.” Conn, at 174 pounds was the lightest challenger to fight for the heavyweight title since Georges Carpentier who weighed only 172 against Jack Dempsey. The lightest men to win the title were Jim Corbett’s 178 in his knockout over John L. Sullivan and Bob Fitzsimmons official weight of 167 over Corbett, although he was certainly much lighter. Tommy Burns weighed 180 when he took the title from Marvin Hart. In his autobiography Louis stated that in order to stave off such talk he made the mistake of dehydrating himself prior to the fight so that could weigh in at less than 200 pounds. “I always use to lay off the day before a fight. But the last day I trained, dieted and drank as little water as possible. Chappie (his trainer Jack Blackburn) was mad as hell.” Joe’s sense of fairness left him critically drained as the fight progressed. Louis controlled the first two rounds, successfully stalking Conn who was yet weary of the Brown Bomber’s vaunted punching power. Joe dominated the second round landing several hard right hands, especially to the body. The third round was competiive. Stanley Woodard of the New York Herald decribed it thusly, "Billy scored with a hook to the head. Louis missed with a right but snapped Billy's head back with a jab. Louis landed a left hook high on Conn's head and caught a hook on the jaw. Louis drove both hands to the body. Billy danced away but Louis reached him with stiff left jabs, scored to the body after pushing Billy to the ropes. Conn suddenly nailed Louis with a stiff one-two and followed with a good left hook. Louis won the round on a small margin." Conn won his first round in the fourth but it too was close. Louis had his best round until the final in the fifth. Louis hurt Conn with a left hook and a hard right, left combination. Billy was cut slightly over his right eye, but it was never a factor. Louis also landed several thunderous body shots this round. Conn admitted that he was hurt in the fifth round to the press after the fight. Conn circled, boxed and picked his shots in the sixth and seventh rounds. By the eighth Louis said he “was exhausted,” no doubt from dehydration. Conn’s fast hands were particularly evident in this round. From this point on Conn took over the match moving in scoring, moving back out of range and circling. Louis weakened from bringing his weight down thought it best to patiently stalk and wait for his opponent to make a mistake. In the twelfth Conn has his best round of the fight. It was in this round that Conn hurt Louis for the only time in the fight near the end of the round. Conn had his own back to the ropes. Louis had just landed a solid hook to the side when Conn came forward off the ropes with a swift left hook of his own to the body. Conn immediately followed up with a cracking left hook to the jaw, a grazing right elbow, and a big, explosive left hook that buckled Louis knees. As Joe took a step back Conn caught him with another left hook to the jaw. Louis back touched the ropes and he forced a clinch on rubbery legs, nearly slipping to the canvas. It was the first time in the fight that Louis seemed bothered by Conn’s punches and Louis was visibly shaken. Fatigued and behind in the scoring it looked as though Louis title reign was nearing the end as he walked back to his corner at the conclusion of the round. Between rounds Jack Blackburn told Joe, “You’re losing on points. You got to knock him out.” The official scores based on New York’s round system after twelve rounds of boxing were referee Eddie Joseph 7-5 and judge Marty Monroe 7-4-1 both for Conn, while judge Bill Healey had it even at 6-6. Reports of the fight state Ad Nauseum that if Billy had just not tried to go for the knockout in the thirteenth round that he would have won. This is a popular myth and it has been widely repeated due to the fact that it was the excuse that Conn gave to the press after the fight. The film tells a different story. If one watches the fight all one sees is Billy boxing the thirteenth as he had the previous rounds that he was winning, by circling and backing away. Conn started the round circling to his left. Louis came out invigorated, perhaps from a rush of adrenaline. Showing no effects of the previous round Louis fought more aggressively due to the urging of his trainer. The Bomber opened the round with a hard jab that snapped Billy’s head back. 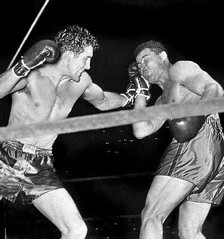 Conn, for his part, continued to circle left, he was not being aggressive, and he was not “going for a knockout.” Conn was still boxing the only way he could to try to win. Louis explained what happened next. “Son of a gun he started that long left hook that I’d been waiting for.” Louis was having his best round in the thirteenth. Conn taking heavy punishment in this round saw the tide turning back in favor of the champion and perhaps himself out of desperation threw a wide left hook that Louis countered with a well timed, tremendous, accurate right hand to the jaw. This punch was before the final flurry of punches by Louis but was the beginning of the end for Conn. Louis, fundamentally flawless, capitalized on any mistake that an opponent made. Conn had boxed marvelously but one mistake was all that Joe Louis had needed. He countered Conn’s missed left hook with his own powerful right. Nat Fleischer commented, “It was the Bomber who sensed the situation at a glance, took immediate advantage of it, laced home a powerful right to the jaw to start the ball rolling.” Conn was frozen. Louis landed a hard right to the body. Conn forced a clinch and they were broken by the referee. Louis pressed forward and caught a slowed Conn with a smashing right to the head that made the crowd yell “OH!” in unison. Conn pitched forward but didn’t go down. Louis pounded a hard right and a left to the body. Louis hammered Conn with a strong right uppercut. There was a minor exchange. The final six punches by Louis were brutal shots. A crunching short right put Billy down with a thud. Try as he might Billy just couldn't quite beat the count of ten. Conn was counted out at 2:58 of the round. Joe Louis, slightly behind in the scoring came from behind to dominate the last round and catch his opponent with some of his best punches, he remains the only man to ever knock out Billy Conn.
Bill Corum, a ringside observer and sportswriter for the New York Journal American, noted that Conn became a victim of a Louis knockout when he was caught by a right hand during the course of normal events, and that weakened by Louis early body attack didn’t have the stamina to stand up to Joe’s vicious assault. That is the true story behind Joe Louis close call against Billy Conn.